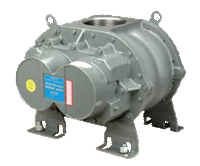 ﻿ Roots Blower Repair and Replacement | Air Blower Services Inc.
We provide service, repairs, & installation of all makes and models of air blowers. 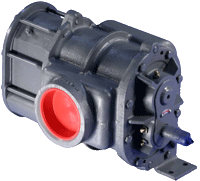 Air Blower Services uses genuine factory OEM parts and is a factory warranty center. We are the premier authorized Dresser Roots blower distributor in the Chicago, Illinois area but provide support nationwide. Ask about our 24 hour roots blower repair services. 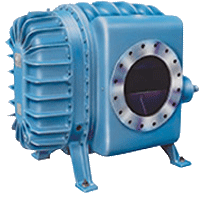 Universal RAI blowers are heavy duty blowers designed with detachable rugged steel mounting feet that permit easy in-field adaptability to either vertical or horizontal installation requirements. Because of the detachable mounting feet, these units can be easily adapted to any of four drive shaftpositions - right hand, left hand, bottom or top. 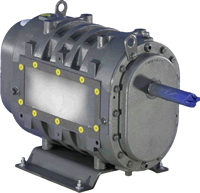 The compact, sturdy design is engineered for continuousservice when operated in accordance with speed and pressure ratings. 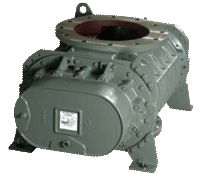 The basic model consists of a cast iron casing and cast iron involute impellers. Carburized and ground alloy steel spur timing gears are secured to the steel shafts with a taper mounting and locknut. 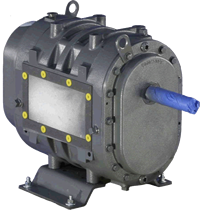 Oversized antifriction bearings are used, with a cylindrical roller bearing at the drive shaft to withstand V-belt pull. 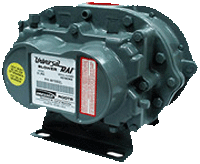 The Universal RAI features thrust control, with splash oil lube on the gear end and grease lube on the drive end. After standard tests, the unit is sprayed with a protective paint and boxed or placed on skids. Available accessories include driver, relief valve, inlet and discharge silencers, inlet filter, check valve, extended base, v-belt or flexible coupling and drive guards. 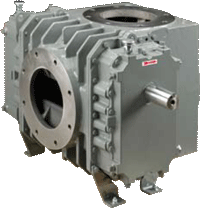 RAM™ rotary blowers are heavy-duty units designed with integral-shaft ductile iron impellers having an involute profile. 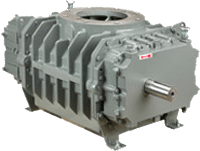 The headplates and rigid, one-piece casing are grey iron, while the drive end cover and gear cover are aluminum. Carburized and ground alloy steel spur timing gears are taper mounted on the shafts, secured with a locknut. Cylindrical roller bearings are used on all units. Piston rings reduce air leakage through the shaft openings in the headplates, and lip-type oil seals prevent lubricant from entering the air chamber. A hydrodynamic seal on the drive shaft prevents shaft seal oil leaks. 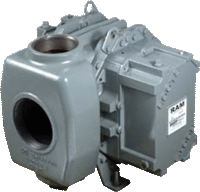 RAM rotary blowers incorporate thrust control, with splash oil lubrication at both ends of the blower. All frame sizes are designed with detachable rugged steel mounting feet which permit in-field adaptability to either vertical or horizontal installation requirements. 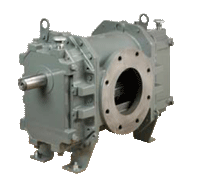 The top shaft is extended for drive on side outlet blowers, and either shaft can be extended for drive on top or bottom outlet blowers. 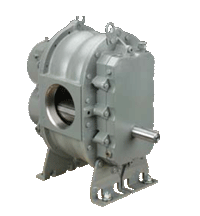 RCS rotary blowers are heavy-duty units designed with integral-shaft ductile iron impellers having an involute profile. The headplates, gear cover, end cover and rigid, one-piece casing are grey iron. Carburized and ground alloy steel spur timing gears are taper mounted on the shafts, secured with a locknut. 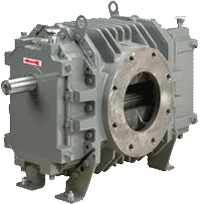 Cylindrical roller bearings are used on the drive end with ball bearings on the gear end. Piston rings reduce air leakage through the shaft openings in the headplates, and lip-type oil seals prevent lubricant from entering the air chamber. The RCS incorporates thrust control, with splash oil lubrication at both ends of the blower. 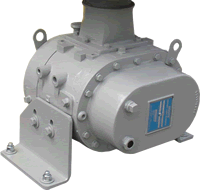 All units are designed with detachable rugged steel mounting feet which permit in-field adaptability to either vertical or horizontal installation requirements. 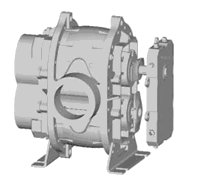 The top shaft is extended for drive on side outlet blowers, and either shaft can be extended for drive on top or bottom outlet blowers. All frame sizes are center-timed to allow rotation in either direction. 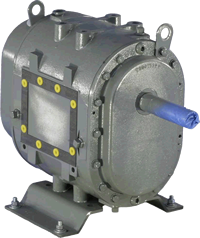 ribbed cast iron casing and ridged headplates, carburized and ground alloy steel spur timing gears secured to steel shafts with a taper mounting and locknut, and cast iron involute impellers. Oversized anti-friction bearings are used, with a cylindrical roller bearing at the drive shaft to withstand V-belt pull. Detachable rugged steel mounting feet permit easy in-field adaptability to either veritcal or horizontal installation requirements. ROOTS DVJ blowers feature an excluseive discharge jet plenum deisgned to allow cool, atmospheric air to flow into the casing. 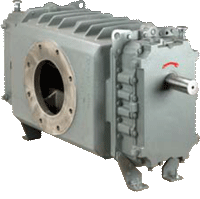 This unique design permits continuous operation at levels to blank-off with a single stage unit, without water injection or heat exchangers. In the case of ROOTS DPJ blowers, discharge air is cooled before injecting into discharge jet plenum. headplates and the rigid casing are cast from grey iron, with aluminum dirive end and gear covers. 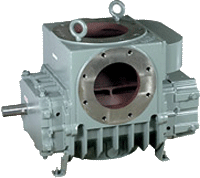 Carburized ground alloy steel spur timing gears are securely munted on taper end shafts. Thsese units are designed with detachable steel mounting feet to permit in-field adaptability to discharge left, right or vertically upwards. 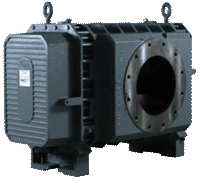 RAS-J series Whispair blowers are heavy duty units for continuous service featuring a proprietary design that reduces noise, pulsation, and horsepower levels over conventional blowers. 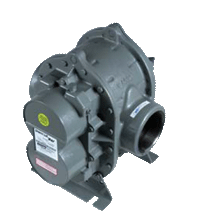 An exclusive rap-around plenum and Whispair™ jet eliminate rapid backflow of air into the blower from the discharge area - a major problem with conventional blowers. 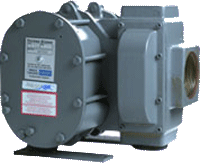 The Whispair Max Rotary Positive Blower has a proprietary design that reduces noise and power loss by utilizing an exclusive wrap-around flange and jet to control pressure equalization.